If you’ve been thinking about “going green ” at home and in your life overall, but aren’t sure where to start, or are worried about maintaining it once the initial feel-good vibes wear off, there are a variety of apps out there to help you make this important lifestyle change. Living green and being eco-friendly isn’t just about saving the planet, it’s about living a healthier, more sustainable lifestyle which benefits everyone! Green kitchen is an app designed to help you make healthier meal choices. Banish those carps and fatty, processed food and explore a variety of organic, vegetarian (delicious!) sustainable dishes which require less energy consumption to make. It features hand-picked recipes which are easy to follow and beautiful photos which will have your mouth watering! If you’re new to the idea of living sustainably, this is the app for you. Green Genie is developed by a slew of eco-friendly professionals and features a massive database of green living tips, sustainable projects to make your home more eco-friendly, and resources to help you make the right purchasing decisions. 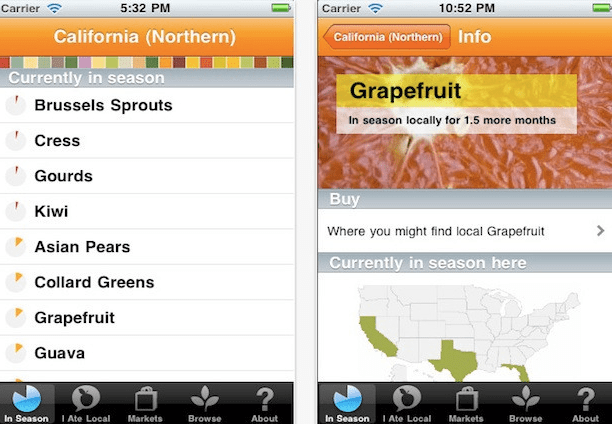 Locavore uses your phone’s GPS to find farmers market’s and farms close to you which sell in-season, local food. Locavore gives you profiles, directions, and lists of what’s in season, as well as a ton of delicious recipes to put that locally-grown food to good use. Yum! The UNEP Carbon Calculator is an app designed to help you understand the impact of your emissions as you travel. As many of us know, greenhouse gasses have some of the worst effects on global climate change, and understanding and curbing those behaviours is one of the best ways we can work to be more eco-friendly. This handy calculator lets you calculate how much CO2 is given off when you travel. Are you the kind of person who wants to know which toothpaste is the greenest, or how “green” your makeup products are? Then this is the app for you! GoodGuide is a terrific little app which allows you to scan the barcodes of more than 120,000 products to see if they’re safe to use or consume, healthy, socially responsible, and green. You can look up the ingredients, nutritional value, impact on animal welfare and human rights, how energy-efficient the product is, and more! 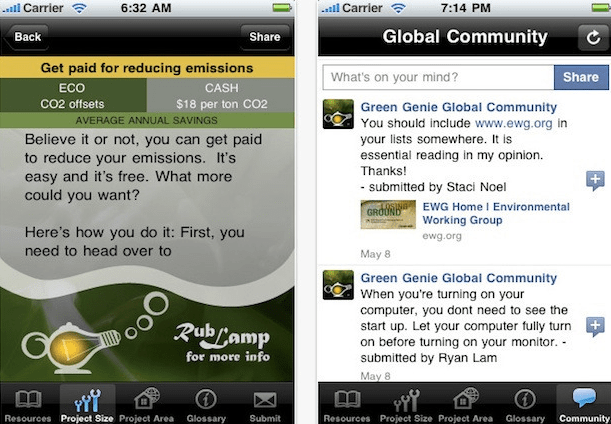 Do you have any favourite green or eco-friendly apps? Tell us in the comments!